Tea tree essential oil, known under the scientific name of Melaleuca, is one of the strongest natural antibiotics used in alternative medicine. It has been used in Australia for almost a decade, but it has become popular all over the world lately due to its efficiency against viruses, bacteria and microbes, even those that are resistant to conventional therapy. Studies have especially shown its antiseptic, antimicrobial, antiviral, antibacterial and anti-inflammatory properties. The products based on tea tree oil have a strong antimicrobial action against E. coli, Candida, Staphylococcus aureus, Klebsiella pneumonia and Acinetobacter baumannii. This miraculous oil is extracted from the leaves of a tree that is grown in Australia, and it’s called Melaleuca alternifolia. The oil is included in numerous pharmaceutical products or it’s used as a remedy for different types of infections, especially skin infections or infections of the respiratory system. A group of Chinese researchers from Beijing Institute of Radiation Medicine and the Pharmaceutical College from Henan University, Kaifeng, China, demonstrated that the product can successfully be used as inhalations in treating bacterial and fungal pneumonia. The study has been made recently, in May 2016. The researchers have created a preparation from tea tree oil which can be inhaled and used by the patients who suffer from pneumonia. Used as an inhalator, this oil proved to be more efficient against fungal infections than Fluconazole – the most popular anti-infective prescribed for fungal infections like candida. 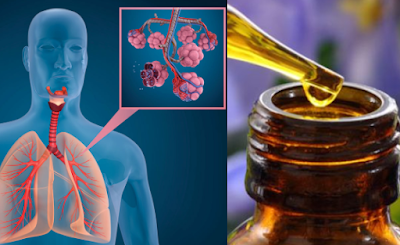 The authors of this study have concluded that tea tree essential oil can be an efficient and safe remedy for treating lungs’ infections, without the risk of having grave secondary effects. How do you use tea tree essential oil? You shouldn’t administer tea tree essential oil internally because it’s toxic and it can affect the delicate tissues from the stomach and throat areas. It’s used only externally: either you use it for massage (diluted with a vegetal oil) or as an inhalator. To prepare a beneficial solution for the sinus and lungs infections, put three or four drops of tea tree essential oil in a pot with hot water (not boiled). Incline your head above the pot, cover yourself with a towel and inhale the warm steam. Also, you can add one or two drops of this essential oil in a saline spray that you can buy from a drugstore. Shake well the spray before you pulverize. Moreover, you can add this oil in a humidifier, then you place it beside your bed during the night or close to your desk or to the area where you spend most of your time. Don’t forget that tea tree essential oil is used externally, not internally because it can do harm to your body. The most efficient way to use it is as an inhalator. If you have a sinus or lung infection, this special oil can help. Besides this, you can use it if you have pneumonia.